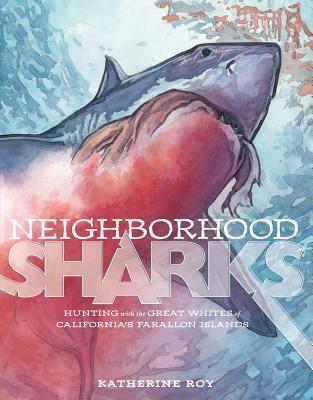 Neighborhood Sharks: Hunting with the Great Whites of California’s Farallon Islands, written and illustrated by Katherine Roy, was a nominee for the 2016-17 South Carolina Children’s Book Award. Neighborhood Sharks is a perfect fit for young (and not-so-young) shark enthusiasts. This book tells readers about the great white sharks that hunt just thirty miles from San Francisco. Each fall, great whites circle the Farallon Islands, an area off-limits to all humans except the scientists who study these massive predators, and search for energy-rich elephant seals. The shark’s biology makes it uniquely suited to prey on these seals and continue the food chain that is so important to the ocean’s ecosystem. Author/illustrator Katherine Roy depicts the sharks’ feeding cycle and biology in vivid, stunning paintings that make readers want to know more. Sources and suggestions for further reading at the end of the book provide readers with options to do just that. Neighborhood Sharks is a great addition to studies of animals, the food chain, and the impact animals can have on the ecosystem. This book definitely has a place in school libraries, public libraries, and classrooms. 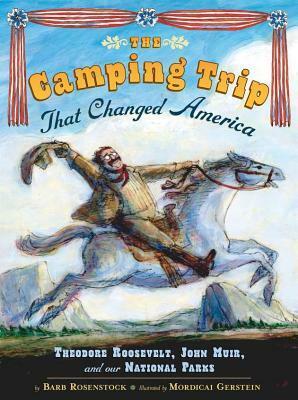 The Camping Trip That Changed America: Theodore Roosevelt, John Muir, and our National Parks, written by Barb Rosenstock and illustrated by Mordicai Gerstein, is a nominee for the 2013-2014 South Carolina Picture Book Award. I’ve told many of my students that Theodore Roosevelt is my favorite president. After reading The Camping Trip That Changed America, I suspect many of them will feel the same. This book explores the 1903 camping trip that took Theodore Roosevelt and John Muir all over the Yosemite area of California. This trip was intended to convince the President that the wild areas of nature needed to be preserved. Roosevelt and Muir spent several nights in the wilderness, and, according to this book and other accounts, discussed how important the wilderness was and how people needed to be concerned with preservation for future generation. A nature-lover at heart, it didn’t take long for Muir to convince Roosevelt that the government had to do something before the nation simply ran out of trees and wilderness. Following this camping trip, President Roosevelt made it his mission to protect the nation’s wilderness. He made several areas into historic landmarks, doubled the number of national parks, and became one of the nation’s most passionate conservationists. And although he and John Muir never crossed paths after their historic camping trip, they remained friends who both did what they could to protect the natural resources of the country they loved. This is a wonderful book for any reader who wished to learn more about the importance of conservation and our country’s–and even the world’s–natural resources and wilderness areas. If even one reader can be convinced that these areas should be preserved, then this book has done its job. Almost immediately, the dares in this war get both Kansas and Francine into a bit of trouble. But their troubles are not limited to vying for the anchor position. Kansas has just moved to California from Oregon, and his mom is divorcing his dad after years of turmoil. His little sister is convinced that Dad will eventually return for good, but Kansas isn’t so sure. Kansas is sure, though, that he absolutely must win this Dare War…even though he didn’t really want the anchor job at first. Francine, who has longed to be anchor for a while, will do whatever it takes to get the job…even if it means eating eighty-seven packets of ketchup, dying her hair green, or going into the boys bathroom. But there may be something she wants more than this position. She wants her parents to get back together. Her dad has moved out, and he and her mom are getting divorced. Francine wonders if there’s anything she could do to fix her family, but how can she do that when her own life is quickly spiraling out of control? It’s clear than Kansas and Francine have more in common than either of them realize. And when the Dare War comes to a head, will they be able to put aside their battle, work together, and form a friendship in the midst of so much uncertainty? Who will win the coveted anchor job? 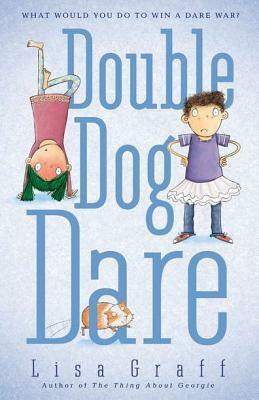 I double dog dare you to find out when you read Double Dog Dare by Lisa Graff! Double Dog Dare was equal parts entertaining and moving. I think many readers will find the dares (and their results) very funny (even though the responsible adult in me cringes at some of these antics). I also think this might be a good book for young readers dealing with divorce. Both of the main characters are dealing with different–yet similar–divorce situations, and this book may let readers experiencing this trauma know that they’re not alone. This book is also a good fit for any student who has ever been a part of his/her school news team or media/broadcasting club. If you’d like more information on Double Dog Dare and other books by author Lisa Graff, visit http://www.lisagraff.com/index.html. 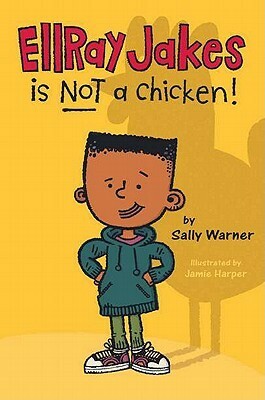 EllRay Jakes Is NOT a Chicken!, the first book in a new series by Sally Warner and illustrator Jamie Harper, is a nominee for the 2013-2014 South Carolina Children’s Book Award. EllRay Jakes is the smallest kid in his third grade class at Oak Glen Primary School, and he’s become the target of a couple of bullies. EllRay isn’t even sure how it started, but he knows that he can’t really tell anyone about it–especially adults–because they’ll just make things even worse. EllRay‘s problems at school are getting him into trouble, but his dad may have just given him the incentive he needs to keep his nose clean. If EllRay can stay out of trouble for one whole week, Dad will take the family to Disneyland! Now, that’s definitely something to work toward, but can EllRay do it? Also, bullying is a central theme in the book, but how it’s approached may be different than it is in some other books. EllRay avoids running to adults about the situation because he thinks they’ll just make things worse. While the adult part of me disagrees with this, the part of me that was bullied as a child knows that this can sometimes be true. And while I don’t think EllRay‘s solution to bullying was necessarily the best one, his message of standing up for oneself might help some young readers to find their own inner courage. EllRay Jakes Is NOT a Chicken!, as mentioned, is the first book in a series. Other books in this series are already out, and there is another on the way. The list below details the titles currently available and the release date for a future title. Hopefully, there will be even more later! 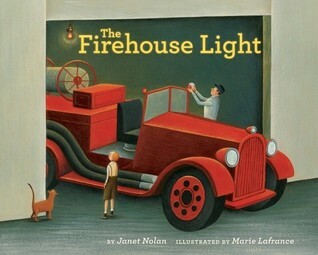 The Firehouse Light, written by Janet Nolan and illustrated by Marie Lafrance, is a nominee for the 2012-13 South Carolina Picture Book Award. This is a true story that would be an excellent addition to Fire Safety Month activities, studies of electricity, or even how cities and towns change over time. The illustrations in this book are as enchanting as the story itself. The pictures bring to mind paintings of early America by such notable artists as Grant Wood, Grandma Moses, Linda Nelson Stocks, Charles Wysocki, and others. A neat activity that might go along with this book would be for students to think of things that haven’t changed over time. They could create their own books revolving around that item and how the things around it changed as years passed.